Venetian or terrazzo style flooring is a centuries-old tradition in Italian architecture. This flooring was essentially laid on site using fragments of marble or stone in various sizes and colours in conjunction with a cement bonding agent. La Veneziane di Cerim is a refined interpretation of these materials, rich in material detail and adapted in colours and style to suit modern spaces. 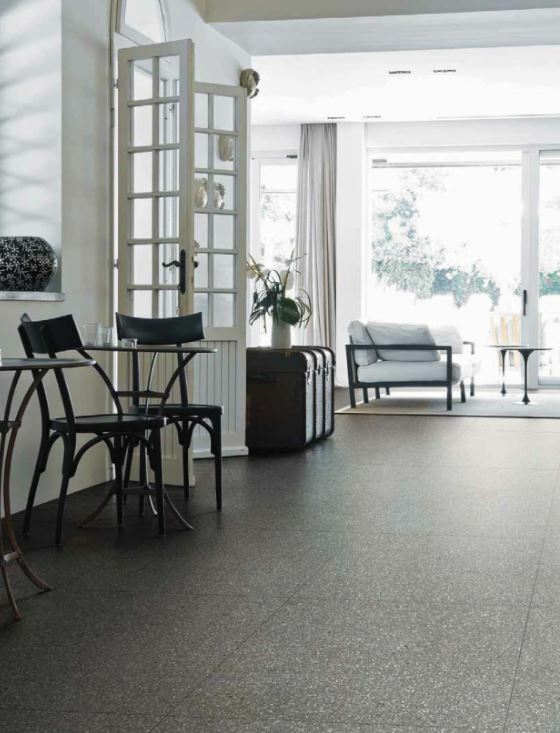 A high-quality porcelain stoneware structure ensures great practicality, durability and ease of installation. Available in three finishes, polished high gloss, matt and R11 anti-skid for external areas. This flooring solution can be found at San Marco Studio and Commercial Division and is available in both matt and gloss finishings. The company focuses on aesthetic and technical performance of their products and recommends the following cleaning procedures when installing La Veneziane di Cerim tiles. If cement grouts are used, remove all residues before completely set. If some traces of dirt are still left, use an appropriate acid detergent for example Fila Deterdek. Never use pure acids or too-strong acid determents as they could potentially damage the grout or the tile. For general cleaning, brush the floor or use a vacuum cleaner to remove dirt or other residues. Afterwards, wash the floor with an alkaline detergent solution and hot water. San Marco recommends Fila Cleaner – a chemical that is highly concentrated and a small quantity is diluted in warm water. These cleaning procedures apply to floor tiles, wall tiles and trims. Fila chemicals do not leave a residue and eliminate the possibility of dirt build-up. For more information, contact San Marco on +27 (11) 918 3800 or via www.sanmarcotile.co.za.